Barrons Online has a nice article about the past, present and future of Toyota's Lexus brand. "Performance is an obvious brand extension for Lexus,"
I have an e-mail subscription to Auto Racing Daily, F1 edition which I seldom read but keep just in case it should develop an interesting nugget of news I've not seen elsewhere. Now, I hate bloggers who spend considerable effort and seemingly all their time and words criticizing other writers and publications but this has gone too far. And I'm hoping that Auto Racing Daily can improve. 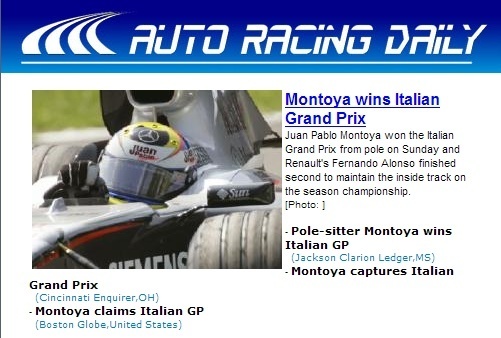 This morning's top headline: Montoya wins Italian Grand Prix. Hopefully, they'll get it changed by tomorrow's edition. Maybe something about Spa? 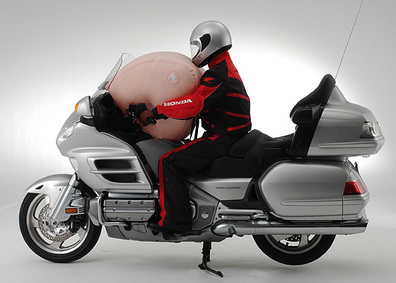 MSN (and a few hundred others) reports that for 2006, the Honda Gold Wing (US only) will be available with an airbag. "The airbag opens in front of the riders and reduces the speed at which they get thrown off the motorcylcle, lessening injuries when they hit the road or another vehicle ... "
This 2000 article from SAE describes an early version. A Honda press release has details about the current system which is scheduled to make a late Spring 2006 appearance in showrooms. "In a deal announced today [September 8, 2005], the 2005 Indy 500 rookie of the year will bear the Secret logo and appear in still unspecified marketing efforts for the brand, likely to include TV and print ads." P&G characterizes both Danica and Secret as "strong-yet-feminine." The whole Danica story has been great for racing. More fans, more sponsors, more money and a better show for everyone.